If you want to gauge the strength of a society, watch what happens to the most well off, when the bottom seems to drop out from under them. Last week, the value of the Linden Dollar against the US Dollar fell sharply for a very brief time-- at least according to the website of Gaming Open Market, a third party currency exchange that many Second Life residents depend on, to buy and sell their in-world money. On the 21st, however, the stated value of the L$ seemed to spike downward, going from highs of over US$1.30/L$250, to much, much less. According to Zeppi Schlegel, GOM’s President and “Chief Geek”, this was actually because a lot less was going on behind the scenes, then appearances suggested-- and at the same time, a lot more. “On the 21st,” Zeppi tells me, “we had a new [GOM] user deposit a large sum of money through several [online money transfer] accounts. They then proceeded to purchase as many Linden Dollars as possible from people who were selling. Then they turned around and sold to all the waiting buyers. The purchases drove the price up. The sales drove the price back down.” Since this user wasn't apparently even a Second Life resident, all of these bogus transactions only existed on GOM's web-based exchange, with no relation to the in-world currency, or ultimately, its market value. “The ‘fraud’ was someone taking advantage of stolen [online money transfer] accounts and purposely manipulating the market,” Schlegel explains. “The trades that took place on the 21st through that account have been wiped from the L$ price history. We consider them ‘erroneous data’ and have treated them as such.” On that day, in other words, all that buying and selling of currency which only exists in an online world did not even exist, either. By the end of last week, the value of the Linden Dollar returned close to normal exchange rates. But before they did, Second Life’s forum boards raged with wild speculation, as residents tried to explain the sudden spike. This was a panicky sell-off by the “land barons”, went one popular theory, frightened that the steady influx of land would hurt their revenue stream. (A nebulously-defined class of real estate speculators, land barons buy and sell land with enormous frequency, sometimes for fairly substantial profits.) Another theory suggested that this was a giant market correction, hitting hard because it was a long time in coming—after all, the Linden Dollar only buys you goods and services in a virtual world. And to be sure, some encouraged calm, inviting worried residents to relax and enjoy watching the invisible hand of capitalism work its strange, unpredictable wonders over their little microcosm. Since the Linden Dollar quickly stabilized back to pre-Sept 21 rates on GOM, however, none of these theories ultimately held much water. What's fascinating to me, at least, is how plausible some of them seemed for that short time. If a few more wealthy residents had taken any of these theories to heart, they might have cashed in their chips, and in the process, provoked a run on the bank, so to speak. And then that would really cause the Linden Dollar to devalue— a situation where misperception becomes reality. In the space of a day, then, you had a market in flux, and on the discussion boards and in wildly circulating gossip around the world, you could see the same forces which impact real world economies at work: rational miscalculation clashing with irrational overreaction, common sense up for grabs, all of it aggregating, for a time, into utter confusion. When real world economies undergo a sudden currency devaluation, it’s the wealthiest members who are the proverbial canaries in the coalmine. Sometimes, sensing anarchy, they cash in their remaining assets, and flee the country. Sometimes they don’t get out in time, and end up becoming scapegoats to forces even larger than them, and history has been particularly cruel, in these cases. 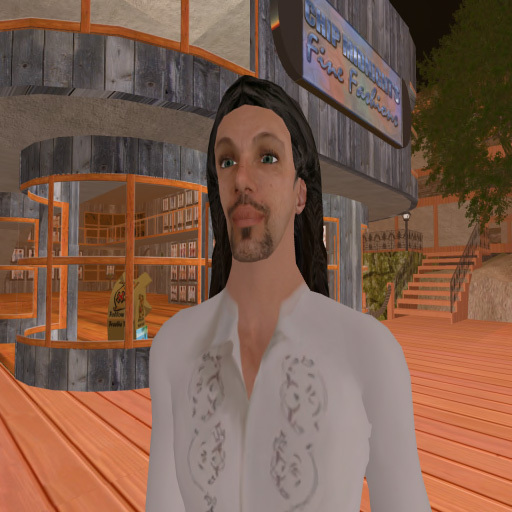 All that in mind, I contacted Second Life’s wealthiest five individual players—as judged by their status last week on the world’s publicly viewable Net Worth Leader Board. As it happens, all of them took either the Donald Trump or Donna Karan path to wealth, getting rich through real estate/casino investments, or personal beauty/fashion sales. I talked to most of them before Zeppi made a public announcement of GOM’s travails, and while they had their own theories as to what (or who) was behind the spike-- and even though we are talking residents with personal wealth in Linden Dollars which have a market value well into the several thousand, in US dollars-- none of them seemed overtly worried by it, or the frenzied finger pointing on the forum. So the daily valuation of the Linden Dollar to the US Dollar isn’t really of much consequence to him. Of the five, only Tony Tigereye took any proactive measures during the spike. “I was watching the forums closely that day for any news,” he says. “I did not believe it was a general market-related function, but rather, that some one individual was heavily influencing things.” He even hit on a way of testing that theory. 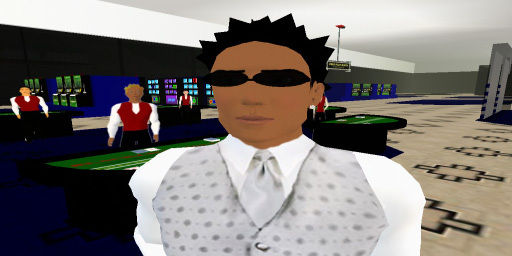 “To address my concerns,” he explains, “I put up a buy offer for L$50,000 at $0.85 per block (250), just to see if anyone was seriously selling Linden Dollars at such a low price.” Tigereye (fourth screenshot) made most his wealth off the profits of his casino games, which may explain why he was willing to take this gamble. And which, in this case, paid off by putting his mind at ease. Like Midnight, Fey Brightwillow (final screenshot) has become fabulously wealthy through fashion. The petite tycoon is standing outside a temple-like complex on an island she owns, explaining her lack of high dudgeon to me. “I don’t panic over things like that,” Fey says. "Just like the stock market, it will fluctuate-- just stay calm and wait it out. Only think panic does is make it worse, and in the long run it will even out. 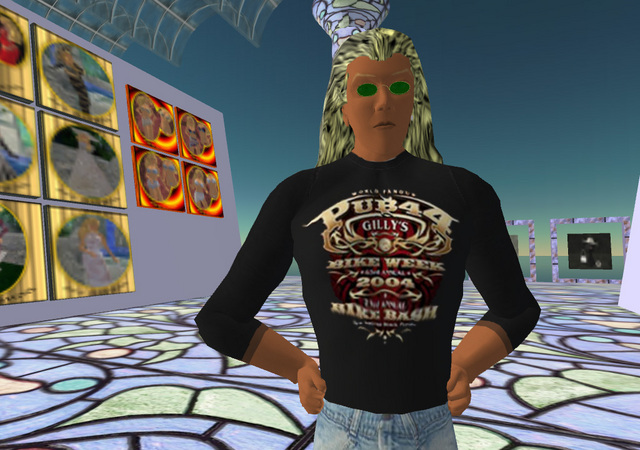 Panic is like fear, the mind killer... fear clouds your decisions,” she adds, quoting Frank Herbert’s Dune-- and effectively ending the discussion-- and any concerns over the health of Second Life’s canaries. Fascinating article Hamlet. I have to wonder, as the SL economy matures, if boom/bust cycles in real estate and currency won't start to become more the norm? I'm glad the fraudster was so sloppy and didn't really hurt anyone this time, but it's kind of scary the potential for chaos there if a few bored and malicious people were to set out to tank the SL economy. Hamlet Linden: Do you think such spikes are likely again? If so, why, and if not, why not? Zeppi Schlegel: I don't imagine so. At least not for this reason. This was someone who was clearly using stolen [3rd party money transfer] accounts purposely causing market disruption. We have since added new security features that should make this type of behaviour very difficult in the future. Of course the market at GOM is completely driven by the in-world supply and demand. It's entirely possible that in-world circumstances could bring about a spike like that, but that type of thing is impossible to predict. I just don't expect this particular fraud-driven spike to happen again in the near future. foreign pharmacy drug is the perfect resource for people to get their drugs without any hassles or awkwardness. We work hard to make sure you save money every time you shop with us. At our online store, you pay less and get more. Just after the launch of Viagra in the pharmaceutical market, the drug has evolved to be the most extensively utilized erectile dysfunction treatment in America. Strikingly, statistics related to viagra and america, i.e. details concerning Viagra use in America point out that other than being used as a prescription drug to treat erectile dysfunction, Viagra is also being increasingly used by the Generation X for recreational purposes. The association between viagra and generation X is alarming and the usage of viagra by youngsters for recreational means should be stopped immediately if the youth brigade is to be saved from ruining themselves. However, old men suffering from impotency can use Viagra on being recommended by a doctor and viagra and old age related information confirm that Viagra has been proved to be a superb cure for erectile dysfunction in old men. No one can ignore the importance of Avodart in shrinking the size of the prostate, lessening the need for surgery for an enlarging prostate, and in improvement of bothersome urinary symptoms.